In 1901, Mennonite Brethren settlers from Minnesota and Nebraska began settling in the Dalmeny area. In September 1901, the church was organized as Ebenezer Mennonite Brethren Church with approximately 42 attenders. The original congregation consisted of immigrants from Nebraska and Minnesota, including the families of Johann Baerg, John Buhler, Peter K. Janzen, Dirk Thiessen, Henry A. Thiessen, Abraham Buhler, Mrs. Johann Lepp, Peter Mandtler, Bernhard B. Fast and Henry A. Bartsch. These early members were Mennonite Brethren people coming from Minnesota and Nebraska. The congregation formally organized on 28 February 1902 with 15 persons present. Abraham Buhler was elected as the first leader of the church and was the first ordained minister in the congregation. Worship services were conducted in various homes, including the hayloft on the Jacob Lepp farm. The first church building was erected in the summer of 1902. The west wing of the 1907 building was the original sanctuary, located at the cemetery about five miles northwest of Dalmeny. Jacob Lepp succeeded Buhler as leader from 1907 to 1941. Lepp baptized 176 members during his ministry at Dalmeny. In 1921 a great revival took place in the congregation under the preaching of George Schultz and 52 were baptized and received into the church. In 1946, after the David Hooge campaign, 36 candidates were baptized in the North Saskatchewan River. 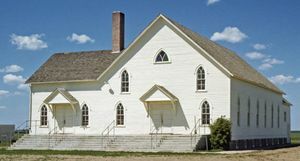 In 1935 people from Dalmeny were involved in building the first Mennonite Brethren church in Saskatoon and in 1937 Dalmeny people helped move the New Hope country church building to Warman, Saskatchewan for use as a place of worship. Continued growth in the congregation led to the construction of a full basement, choir loft and a larger entrance in 1945. By 1950 the congregation had 246 members, making it the largest Mennonite Brethren congregation in Saskatchewan. The church moved to Dalmeny in 1952 and a new sanctuary was built and dedicated in June 1968. In 1986 the Ebenezer Mennonite Brethren Church changed its name to the Dalmeny Community Church. The congregation celebrated its centennial in October 2001. Fuenfizigte Jubilaeum der Beiden Ebenezer Gemeinden in Saskatchwan, Canada, 9. bis 11. Juni 1939 (1939), 15 pp. Centre for Mennonite Brethren Studies. Lepp, Martha. Ebenezer Mennonite Brethren Church: 75th Anniversary. Dalmeny, Sask., n.d., 19 pp. Mennonite Brethren Herald (27 May 1988): 68; (21 December 2001): http://old.mbherald.com/40-24/news-7.html. Toews, John A. A History of the Mennonite Brethren Church: Pilgrims and Pioneers. 1975: 157-158. Available in full electronic text at: https://archive.org/details/AHistoryOfTheMennoniteBrethrenChurch. Centre for Mennonite Brethren Studies, Winnipeg, MB: Volumes 580–583, Microfilm Reels 8-9. Church records microfilmed at Bethany Bible Institute, Hepburn, SK. Lepp, Waldo and Richard D. Thiessen. "Dalmeny Community Church (Dalmeny, Saskatchewan, Canada)." Global Anabaptist Mennonite Encyclopedia Online. March 2015. Web. 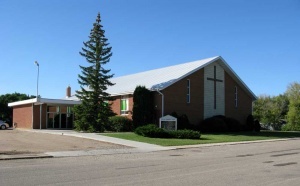 22 Apr 2019. http://gameo.org/index.php?title=Dalmeny_Community_Church_(Dalmeny,_Saskatchewan,_Canada)&oldid=163462. Lepp, Waldo and Richard D. Thiessen. (March 2015). Dalmeny Community Church (Dalmeny, Saskatchewan, Canada). Global Anabaptist Mennonite Encyclopedia Online. Retrieved 22 April 2019, from http://gameo.org/index.php?title=Dalmeny_Community_Church_(Dalmeny,_Saskatchewan,_Canada)&oldid=163462.